How do I get my bathroom looking properly clean? Grubby shower tray and all. 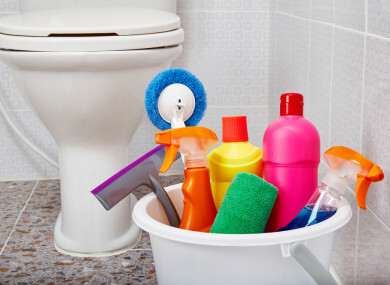 UNLIKE SOME OTHER areas of of the home, you can’t always escape with just a “quick tidy-up” of the bathroom. There’s a great sense of satisfaction in knowing your bathroom is deep-down hygienically clean, and it’ll make your home a healthier and safer environment to live in too too. The first places to show dirt in the bathroom are glass surfaces like the shower screen. Glass will show even the slightest of water marks, so the best way to deal with this is to prevent it building up in the first place. Use a squeegee to wipe the glass surface after each use of the shower. It only takes a few seconds, and that little time spent will add up to a whole lot less cleaning overall. This one from Argos (€22) comes with a suction-cup holder for hanging in the shower, and is stainless steel too. I use a Dan-Mop system for my floors, which has a microfibre cloth that can be easily washed, wrung out and replaced. I have one mop head and handle, and use different colour-coded cloths for different parts of the house. There’s no need for a bucket of dirty water either: simply fill a spray bottle with diluted floor cleaner and then just spray and wipe. The mop head, mop cloth and handle are all sold separately. Most bathrooms include a tiled area, and the grout lines can be difficult to keep clean, especially in older homes. A steam cleaner is a fantastic tool for the job. The heat helps to loosen dirt and it will also kill mould spores, viruses, and bacteria. I’d recommend opting for one with range of attachments suitable for cleaning floors, windows, and upholstery as well as tiles, like this Morphy Richards 9-in-1 option. The items that get most use in our bathrooms are the toilet and sink, and therefore they need the most cleaning. Scrubbing them both is unavoidable, but you don’t need to use heavy bleaches to get them sparkling. I love Lilly’s Eco Clean, a range of non-toxic cleaning products – the toilet cleaner is tea tree oil based and is lot more pleasant to clean with than some other bathroom products on the market. Email “How do I get my bathroom looking properly clean?”. Feedback on “How do I get my bathroom looking properly clean?”.